I have seen this film before, I don't really remember when. I know I did not see it when it was originally released. I say this because I know it's a sentimental favourite for many people. I have no history to speak of with this film. Is it good? Yeah, it's okay. It's a decent execution of an oft repeated formula. Pat Morita and Elizabeth Shue are pretty great. Ralph Macchio ... not so great. Everyone saw him win with a kick to the face, right? Pat 'Yoda' Miyagi must've Jedi mind tricked that judge. Nearly broke my brother jaw doing the crane. Need to practice more. There are better movies with this formula, but worse ones, too. Fortunately, the master/student relationship works really well. From the director of Rocky. We have another underdog story to uplift us and remind us of the 80s in the best way possible. 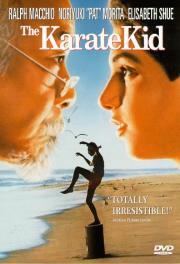 The Karate Kid is totally predictable and enjoyable to a fault. Thankfully there is the talents of the main cast and a totally era appropriate soundtrack to keep things interesting.